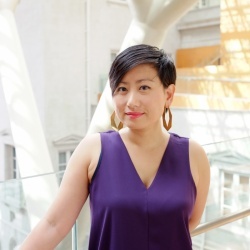 Adele Tan received her PhD in art history from The Courtauld Institute of Art, University of London and is currently Curator at National Gallery Singapore. Her research focuses on contemporary art in Southeast Asia and China, with a special interest in performative practices, photography and new media. Exhibitions she has worked on at the Gallery include “Between Declarations and Dreams: Art of Southeast Asia since the 19th century” (2015), “A Fact Has No Appearance: Art beyond the Object” (2016), and “Yayoi Kusama: Life is the Heart of a Rainbow” (forthcoming in 2017), and she was part of the curatorial panel for the 4th Singapore International Photography Festival. She was formerly Assistant Editor at the British art journal Third Text and her articles have appeared in numerous scholarly publications, exhibition catalogues, and journals such as PAJ, Broadsheet, Yishu, Eyeline and Third Text, among others. She has also participated in the Global Art and the Museums fellowship programme at ZKM, Karlsruhe; SYNAPSE: The International Curators’ Network at Haus der Kulturen de Welt, Berlin; and the inaugural Tate Intensive programme in 2016.